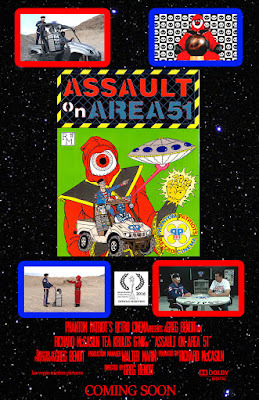 Phantom Patriot Retro Cinema Episode 2: Assault on Area 51 is Online! Welcome to rare new post on the Heroes in the Night blog. While working on my book Heroes in the Night, I was introduced to a person named Richard McCaslin aka the Phantom Patriot, who has an interesting life story I thought would make a good book in itself. It's been an exercise in patience-- I've slowly been working on this book since 2010. There is still a way to go, but it is getting there. I decided one thing I needed was a trip down to Nevada, where Richard now lives, so I could visit him in his home environment. I asked if there was anything in particular he'd like to do when I visited, and he mentioned shooting an action packed script he had written, with myself as a co-star (along with actor extraordinaire G'nik and villain Illuminus). I was game, and the result is the following video, which I am told will be an official selection at the High Desert Film Festival in Pahrump, Nevada. Exciting stuff! Hey, it's been a long time since I've posted here. However, this blog is very slowly going to wake up out of hibernation as I continue work on my current book project. That book is yet untitled, but the main person appearing throughout the book is Richard McCaslin aka the Phantom Patriot. There are many aspects to the Phantom Patriot, but for now enjoy his latest project: "Phantom Patriot's Retro Cinema," a show that combines the Phantom Patriot persona with classic horror host style shows like Mystery Science Theater 3000, Commander USA's Groovy Movies, etc. Here now is the pilot episode for Phantom Patriot's Retro Cinema. Episode 2 is already in the works and will have a special guest star...me! Yes, I went down to Nevada for a few days to meet up with Richard. I got some interview time and co-starred (along with Phantom Patriot's alien head sidekick G'Nik and the sinister villain Illuminus) in episode 2. It was a wild adventure and I can't wait to write all about it. Keep Track of Heroes in the Night!!! Hello, my friends, Tea Krulos here. As you might have noticed, this blog has not had a new post in months. I am just too busy with other stuff. My book, Heroes in the Night, was released a little more than a year ago. I am continuing to promote when the opportunity arises (I was recently a guest on Ingrid's Inspirational Hour and next week I will be hosting a panel of RLSH at Fantasticon here in Milwaukee) but I'm also working on other projects. Here's how you can keep in touch. The Heroes in the Night Facebook Page is still active. I post updates on what I'm doing and share links to RLSH stories (and other random things I think are related) on a regular basis. It sometimes gets some entertaining commentary, too. I also have a Tea Krulos author Facebook page where I give updates on what I'm working on. My personal site and blog has information on past, current, and future things I am writing. And if you haven't yet, please buy a copy of Heroes in the Night. Several links are below. Researching RLSH Finds More "Early Prototypes"
Hello, my friends! It's been awhile since I've posted here, but I've been VERY busy wrapping up travel, research, and writing for my next book. It's about the lives of paranormal investigators and will be out in 2015 from Chicago Review Press. Knight-Hood is an RLSH from Saint Petersburg, Florida (you can read an interview I did for him for Pop Mythology HERE) who has done a lot of research into early comic book history, as well as the history of the RLSH movement. Recently, he has written on Clayton Moore, the actor who portrayed the Lone Ranger and who wore the costume and did good deeds off camera. He also wrote on luchador El Santo and wrote the following on El Murcielago, the bat themed luchador that was stepping into the ring a year before Batman was created. El Murcielago, which translates as "The Bat" was a Mexican wrestler whose debut match was April 3rd, 1938, a full year before Bob Kane and Bill Finger created Batman in Detective Comics #27 and also before Norman Daniels aka G. Wyman Jones introduced his pulp fiction hero the Black Bat in July of 1939. Bob Kane maintained until his death that the only Bat character he knew of prior to creating Batman was the villain in the 1930 film "The Bat Whispers", but what of Bill Finger? Could Finger perhaps have seen a photo of El Murcielago prior to drawing Batman? As you can see in the photo the full length cape, black boots and trunks are all there but as an artist myself, I was particularly struck by El Murcialago's thigh muscles which bear a strong resemblance to those drawn by Finger of Batman's in Detective #27. A coincidence? It's possible. After all Batman and the Black Bat only came one month apart in 1939 and were created independently. Even though his influence on American comic books is debatable, El Murcialago aka Jesus Valazquez was one of the original wrestlers who helped create the world of lucha libre or "free wrestling" as it translates. He was one of the first, if not the first to wear a mask in the ring and would be followed by thousands to come. These masked characters were far more to their Mexican fans than mere wrestlers, but are considered true folk heroes. Many like the famous "El Santo" appeared in comics, and multiple films in character as well as personal appearances. This culminated in 1996 with Super Barrio, one of the first of the RLSH community, who uses his image to organize labor rallies, protests and file petitions for better living conditions for the poor. Super Barrio is joined by other luchadors who battle corruption, animal rights, pollution and poverty. So there is little doubt that El Murcielago, "The Bat" is definitely one of the precursors to the real life superhero movement. First, I’ll be talking about Heroes in the Night at the next MKE Comic Book Meet-up, April 22. This is a cool group in Milwaukee that meets up on a regular basis to discuss comic books. The them for the next one is "Social Issues in Comics” and they kindly asked me to be part of it. The first part of the evening will be a discussion from 6:30-7:45pm about comics that have tackled social issues. People are encouraged to bring comics they’d like to talk about. 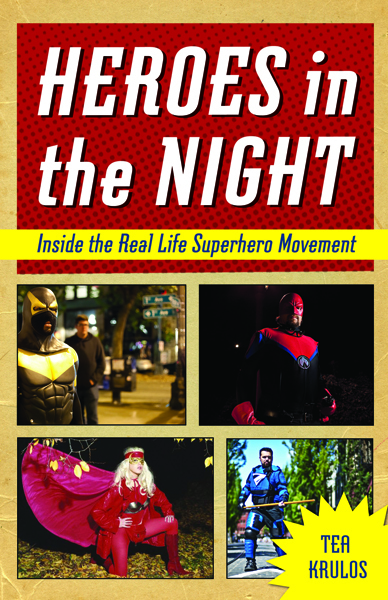 I will be talking about Heroes in the Night afterward from 7:45-9pm, particularly focusing on how the subject of the book (Real Life Superheroes) reflect their comic book counterparts. I’ll be showing some slides and I will have copies of the book available for a flat $16. This is going to be a fun time at Anodyne Coffee in Walker's Point, a nice, casual environment. The panel is titled “You Can be a ‘Real Life Superhero!’” I’ll be moderating special guests Razorhawk, the Watchman, Crusader Prime, Crimson Catalyst, and Night Vision. We will also have a couple surprise guests appearing via video message. I will be showing some slides and we will be talking about what this Real Life Superhero business is all about. We also will have a Q & A session with the audience. Hulk Hogan will be at C2E2, but I can’t speculate if he’ll show up for the panel. Today is the anniversary of the death of Kitty Genovese. Some Real Life Superheroes (as discussed in further detail in Heroes in the Night) treat this day as a sort of memorial holiday, making sure they are out on patrol. Some hand out flyers about the incident (in which Genovese was murdered while bystanders ignored it) and for others, the date marks the first time they patrolled. RLSH say their hope is to prevent another Kitty Genovese story from happening. Be safe out there! HEROES IN THE NIGHT TO BE FEATURED AT C2E2! Ladies and gentlemen, Tea Krulos will be moderating a panel of Real Life Superheroes at this year's Chicago Comic & Entertainment Expo. The panel is titled "You Can Be a Real Life Superhero!" and will take place Sunday, April 27, 2:30-3:30PM in Room S401AB. The panelists include Razorhawk, the Watchman, Crusader Prime, Crimson Catalyst, and Night Vision. They will discuss the "trade secrets" of being an RLSH and the session will include a Q & A with the audience. There will also be some short video messages from a few surprise guests. Afterwards, Tea Krulos and members of the panel will be hanging around the Chicago Review Press booth where you'll be able to buy a copy of Heroes in the Night and get it signed by the author and the RLSH. Please help spread the word and hope to see you at C2E2! WELCOME TO HEROES IN THE NIGHT! My name is Tea Krulos and I'm a freelance writer from Milwaukee, Wisconsin. I was introduced to the Real Life Super Hero(RLSH) story in late February, 2009. As a lifelong fan of comic books and unusual and unique people and subcultures, I was immediately hooked. 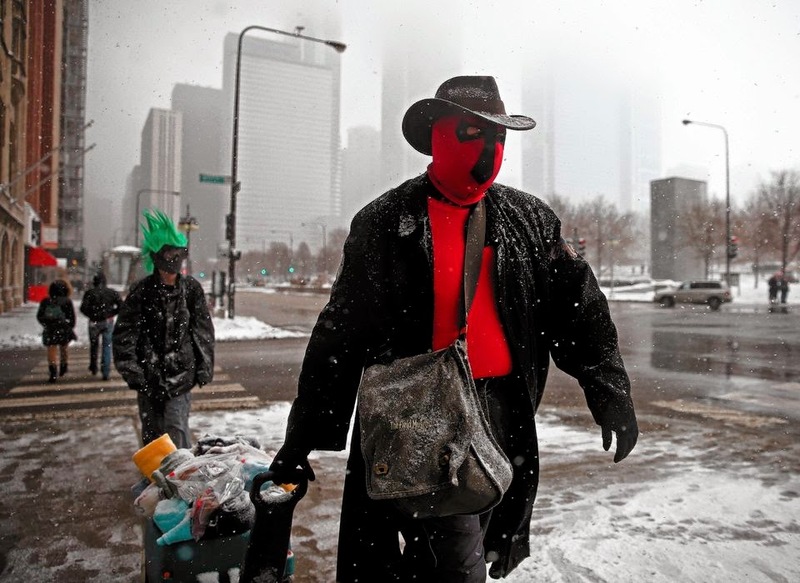 I was determined to find a local RLSH if there was one and found The Watchman, a man who dons a red rubber mask, suit, and trenchcoat and patrols the streets of Milwaukee. I had a long, fascinating interview with him in person one night and determined that the short magazine piece I had successfully pitched did not scratch the surface of the story and decided to write a book. After a few months I also established this blog- both the book and the blog are titled Heroes in the Night. My book is based on extensive research, interviewing, and field work. I have traveled to meet RLSH in Minneapolis, Rochester (Minnesota), Brooklyn, Vancouver, Portland, Seattle, San Diego, New Bedford (Massachusetts) , and Washington DC, as well as meeting regularly with the Milwaukee crew. I have been quoted as an expert on the subject in the New York Times, Wall Street Journal, People magazine, Seattle Weekly, Scientific American, io9.com, Milwaukee Journal Sentinel, and dozens of other newspapers, magazines, websites around the world. I've also made appearances on a dozen radio shows and have been filmed for three different RLSH documentaries. I have written articles on the subject for Milwaukee magazine, the Boston Phoenix, New York Press, Forces of Geek, Riverwest Currents, and Delayed Gratification. Heroes in the Night will be published in Fall 2013 by Chicago Review Press. Pop Mythology reviews Heroes in the Night! Tea Krulos is an award winning freelance writer from Milwaukee, WI. 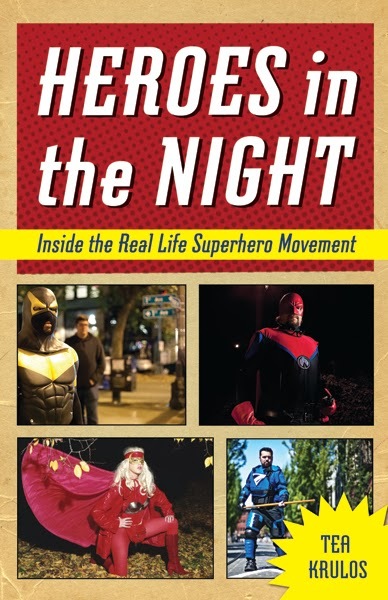 His first book is titled Heroes in the Night: Inside the Real Life Super Hero Movement.